This is an article that I wanted to write for a long time. It is a bit long, maybe that's why I took such a long time to write. However, this is our favorite Southern California tour. When we have friends and family visiting from outside of California we always take them on this tour because they get to see some of the best tourist sites in SoCal. Yeah, it's true, this tour doesn't include Disneyland, Universal Studios or Sea World, but those are attractions that anyone would know about. Our tour hits the best things to see in SoCal apart from amusement parks. The best thing about this tour is that it can be done in one day…a full day that is. First stop: Santa Barbara for 3 hours. 9:00 am. Start early in the morning by driving to Santa Barbara. Take the 101 freeway north and exit Cabrillo Boulevard. Just follow the road and park on the street. Try to find parking as close to State Street as possible. It is easier to find parking before getting to State Street than after. Once you parked, start walking on Cabrillo Boulevard toward State Street. You can even walk on the beach if you want…I love it ! Once you get to State Street you have a few options. You can walk on the pier and then go up State Street or choose to come back to the pier later. There two easy ways to get into town. My preference is to start walking up State Street…it’s takes a little longer but it’s fun to see all the people and the stores on State Street. The other option is to take the electric tram. For a quarter you can get up State Street very quickly compared with walking even though the tram runs slowly. 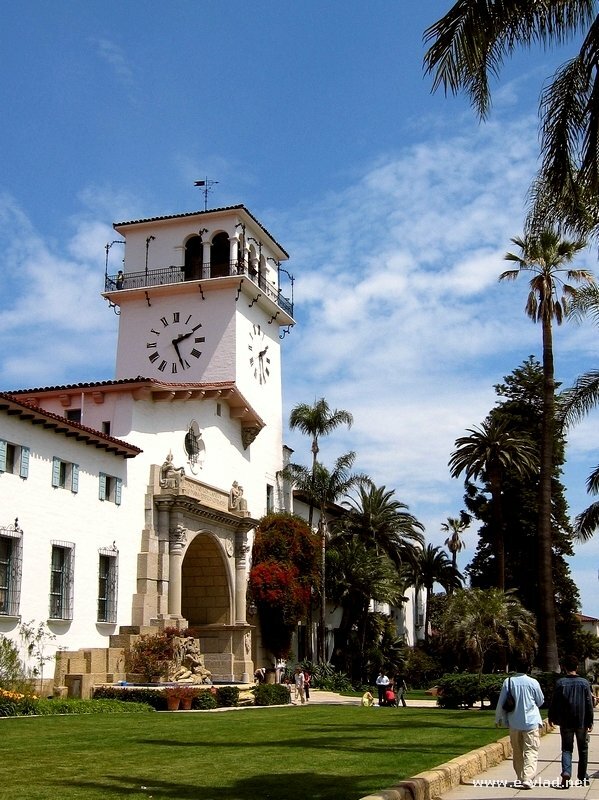 Santa Barbara, California – The Courthouse tower provides great panoramic views of Santa Barbara. Wether you walk or take the tram, look or ask for the Santa Barbara Courthouse. Visit the interior gardens and then start visiting the interior. Make sure you take the elevator to the top floor and go to the tower. The view from the Courthouse tower is amazing: you get to see the ocean, the mountains and of course all of Santa Barbara. Catch the tram and go up to the Santa Barbara Mission. You can choose to visit the Mission itself or just stroll through the park in front of the Mission. It is actually a beautiful rose garden. The beach. Walk, sit and admire. Read my article about the coolest things to visit in Santa Barbara. Walk on State Street and just look at things and people. Santa Barbara court house and tower. Don’t miss this one. 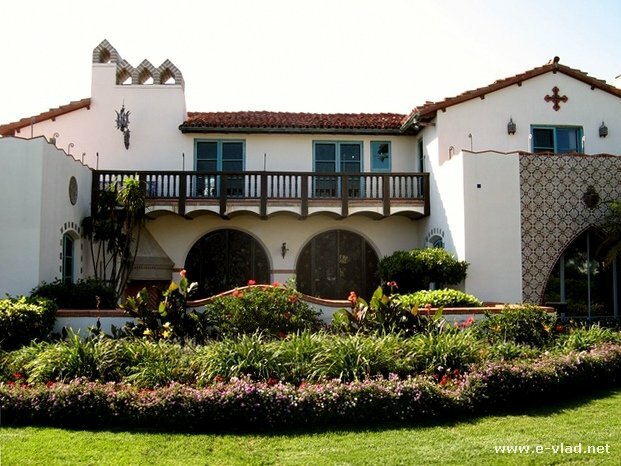 See pictures of the Santa Barbara Courthouse. Santa Barbara Mission. See my pictures from Santa Barbara Mission. Santa Barbara Zoo optional. This will take you a while and it will prevent you from seeing all the other things on this tour. However, if you want to just spend the day in Santa Barbara, the Zoo is the perfect place. 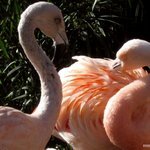 Read my article about Santa Barbara Zoo. Have lunch somewhere on State Street. There are plenty of restaurants. 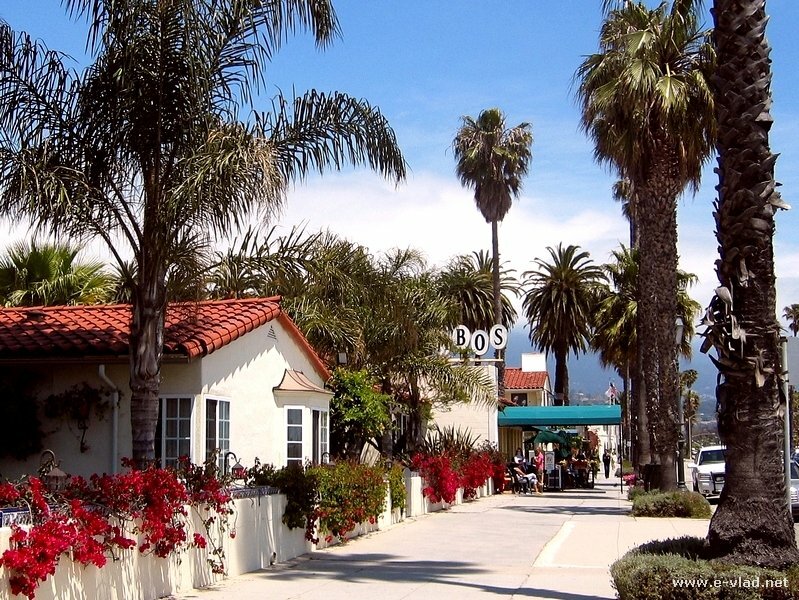 Santa Barbara, California – Spanish style architecture abounds on the streets of Santa Barbara. Now it’s time to head south to Malibu. Take Cabrillo Boulevard back the way you came and get on the 101 Freeway South. It will take you about one hour to get to Malibu. Just relax and drive slower and enjoy the view ’cause you really have what to enjoy. 1:00 pm. Drive south on the 101 freeway and go through Ventura and parts of Oxnard. When you get to Rice Avenue, exit the freeway and take a right. Go down on Rice Avenue until you hit Highway 1 PCH (Pacific Coast Highway). Take the 1 south towards Malibu. Watch for Mugu Rock which should come up in ten minutes of driving on Pacific Coast Highway. It’s a big pointed rock on the right hand side of the highway. You can stop and admire the view. Don’t try to climb to the top because it will take you a while and you won’t have time to see the rest of the things. Continue driving south on Pacific Coast Highway for about 30 minutes until you reach Malibu. Pass Malibu Road and watch the road for a sign on the right hand side of the road that says Adamson House. It is right after crossing the Malibu Lagoon, or in other words right after going an a large bridge. For a more precise location visit the Adamson House website. Malibu, California – Adamson House was built in the 1930s and offers stunning views of the ocean. Point Dume and Zuma Beach are just gorgeous places to stop and see. Especially Point Dume is a great scenic spot in Southern California. A short walk will reward you with panoramic views of the Southern California coast and if you visit during winter, you might see some whales as well. Adamson House is a house built in the 1930s that has kept all the furniture and kitchen apliances from that time. I believe it is well worth the one hour tour. The views from the balcony of the house are amazing. See my pictures from Adamson House in Malibu, California. Malibu Lagoon Park is located right in front and to the right of Adamson House. Just exith the Adamson House complex towards the Pacific Coast Highway and keep walking on the street until you find a way to get to the beach. Or get in your car and drive a few hundred feet and park on the side close to the Malibu Pier. Then you can walk on the beach back toward Adamson House. You will come into the Malibu Lagoon Park. It is full of birds and other marine life. See my pictures of the Malibu Lagoon Park. Malibu Pier is again in walking distance from Malibu Lagoon Park so it’s right there for you to enjoy. 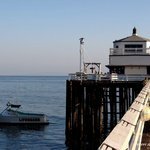 See my pictures of the Malibu Pier. Now it’s time to leave the quiet Malibu behind and head for the loud and fun beach town of Santa Monica. You would have to drive a bit but again, drive slowly and make sure you admire the scenery because there is a lot to see. 3:30 pm. From Malibu, continue driving south on the Pacific Coast Highway all the way down to where it meets the 10 Freeway. Right before meeting the 10 freeway, on the right-hand side you will see a huge parking lot (click link to see the entrance in Google Maps). Pull in there and pay the daily fee ($10-$15). You will not be able to find better or cheaper parking in this area, so just pay the fee. Then walk up to the Santa Monica Pier. Santa Monica, California – Beautiful view of the Santa Monica Pier seen from a nearby highrise. Santa Monica Pier is the heart of this beach town. It is filled at all times with locals and tourists. 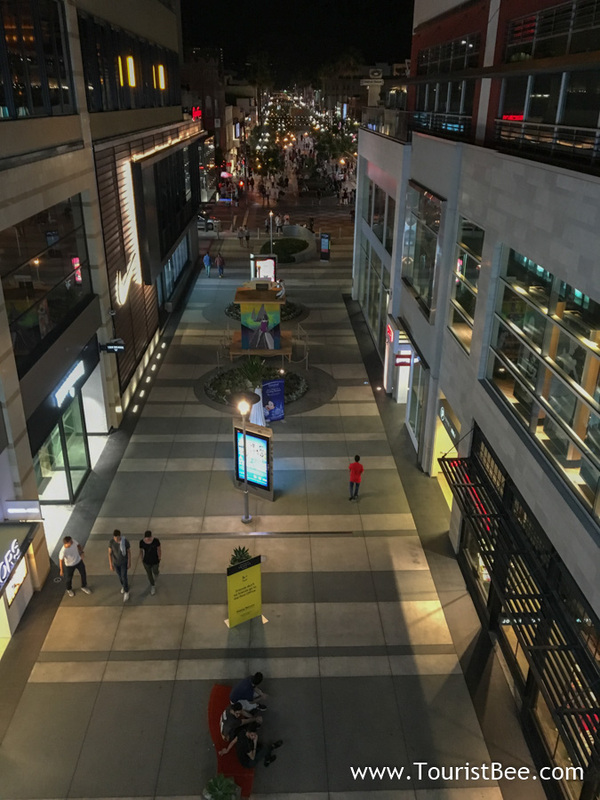 Third Street Promenade is a large pedestrian area a couple of blocks from the Santa Monica Pier. This area is filled with restaurants, a large mall and lots and lots of people and street actors. Now it’s time to leave the beach behind and visit the place of the rich and famous. 6:00 pm. Go back up north on Pacific Coast Highway all the way down to Sunset Boulevard. Take a left on Sunset Boulevard and follow it all the way to Beverly Hills. It will take you about 1 hour. You will pass right by UCLA and if you have time you can stop for a quick visit. You can also visit the Getty Center but that will take the whole day. Well, there are way too many things to see in Southern California. Ok, ok…let’s just stick with my plan, so keep driving on Sunset Boulevard until you reach the famous…drumroll please…Rodeo Drive. Take a right on Rodeo Drive and go down, slowly again for two block and right after you pass Camelita Ave park somewhere on the street. Then start walking down Rodeo Drive. The actual world famous stree starts right after Santa Monica Boulevard…so keep walking for a little bit. If you’re tired you can stop at the Beverly Gardens park which is right here on Rodeo Drive and Santa Monica Boulevard. 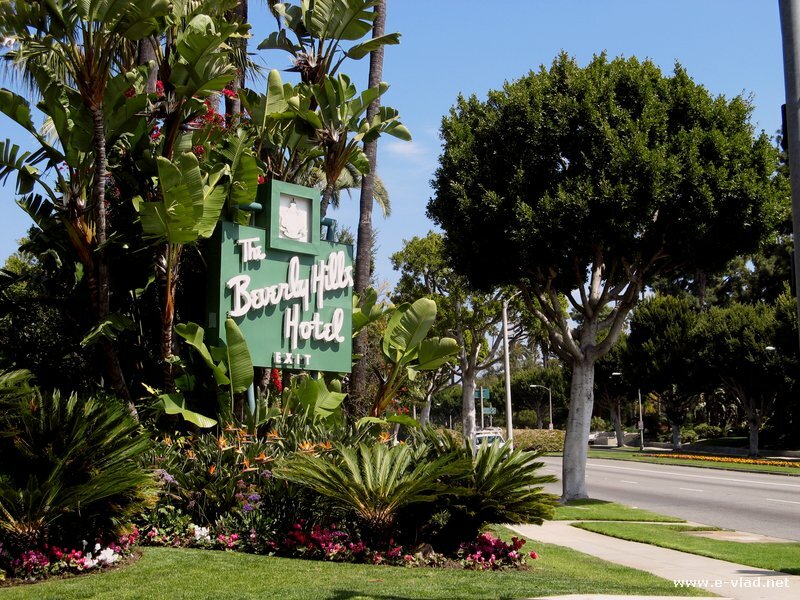 Beverly Hills, California – The Beverly Hills Hotel is a famous landmark. Walk on Rodeo Drive from top to bottom. Yeah it’s expensive to shop on Rodeo Drive, but nobody forces you to shop…just stare at stuff :) and look important! Please notice that at the end of Rodeo Drive, on Wilshire Boulevard and Rodeo Drive is the famous Regent Beverly Whilshire Hotel where the movie Pretty Woman was filmed. Walk the streets in the residential area and admire the houses. Walk back towards your car after Santa Monica Boulevard and start walking some of the streets…it’s very relaxing. You can also admire the unique houses you see in Beverly Hills. Who knows, maybe you’ll run into Madonna or Elton John. Just say hi if you do ! Avoid buying star maps…they are expensive and inaccurate. Yep, it’s true ! I have bought a star map and we ended up chasing many addresses that didn’t actually exist. Just save yourself the frustration. 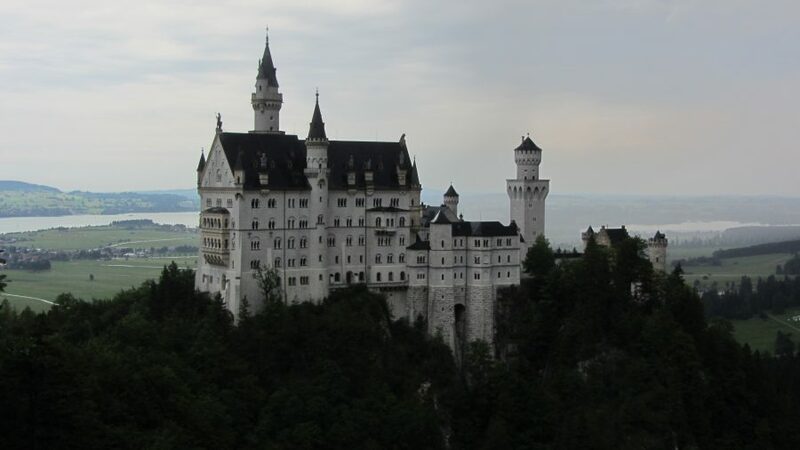 Plus, if you actually do get to see a famous star’s house, be sure that it’s surrounded by a tall and thick wall that will prevent you from seeing anything. 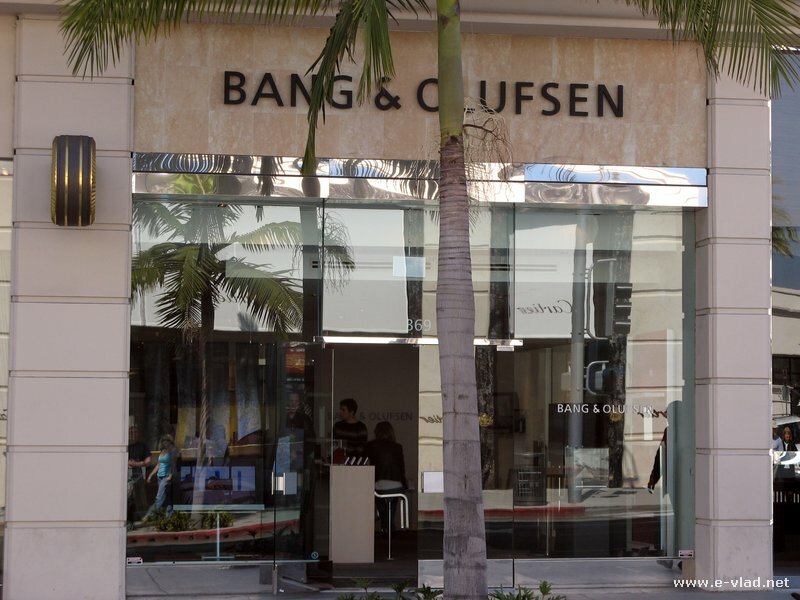 Beverly Hills, California – The Bang & Olufsen store on Rodeo Drive. Now it’s time to go to Hollywood, where the stars are made! Well, that’s what people say but don’t get your hopes up because you will be disappointed. Hollywood is only glamorous in the movies and not in reality. Granted, the city has cleaned up the area very much and they brought the subway all the way there. Great improvements to be fair, but the area is far from what it’s made to look like in the movies and in the media. But it’s fun to see it anyway. 8:30pm. If you still have any energy left, continue driving on Sunset Boulevard all the way to La Brea Well it will take you about 30 minutes and you don’t have to slow down because there is not much to see on this portion. However, you won’t be able to go too fast anyway because trafic in Hollywood is pretty bad :( . 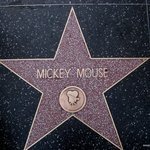 Take a left on La Brea and a right on Hollywood Boulevard and then look for public parking sign on the left right around the Hollywood Mall and the Chinese Theater. It doesn’t mean that if it’s public it’s free…it’s not, and it’s not cheap either but that’s your best bet for parking. Don’t forget to get some dinner…not on Rodeo Drive though if you want to have any money left. 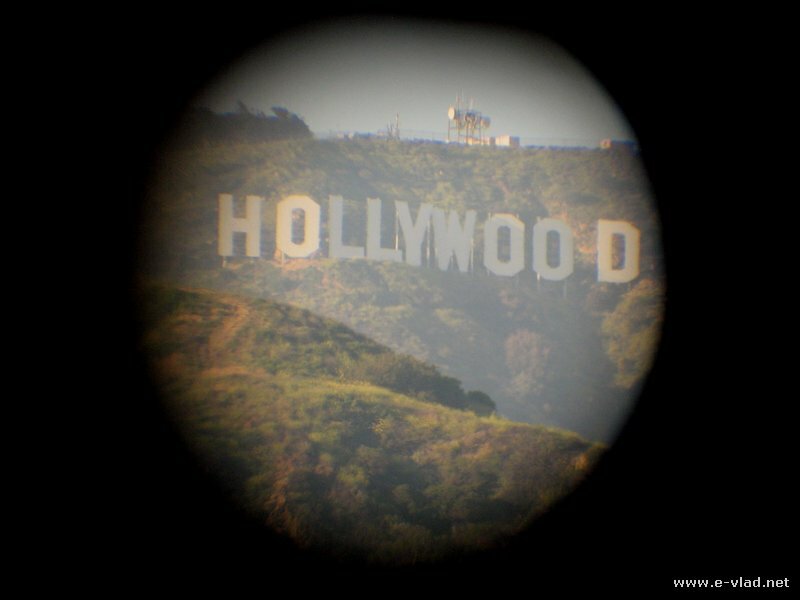 Hollywood, California – The Hollywood sign seen through binoculars. Take pictures with the “movie” characters you’ll find everywhere. Walk inside the Mall and go up to see the Hollywood Sign. They have even built a red carpet for you to walk on. Visit the Wax Museum. It’s worth seeing…once. 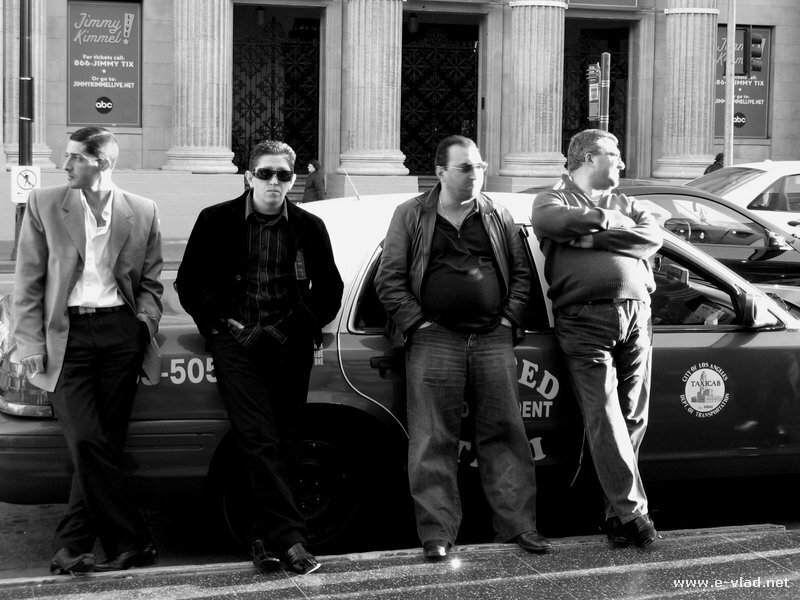 Hollywood, California – Taxi drivers waiting for customers on Hollywood Boulevard. If you’ve done well, you should be done before midnight! It’s very easy to get to the freeway from Hollywood Boulevard. Just follow the road to Vine St and take a left. Follow the signs that will guide you to the 101 Freeway. Can you see most popular Southern California tourist attractions in one day? By the end of the day you will be dead tired…guaranteed. This tour is not recommended if you have small children…they will hate you for putting them through such a grueling schedule. You can break the trip into two days if you have kids. If you children are old enough they will also love this trip. There is plenty to see for everyone. 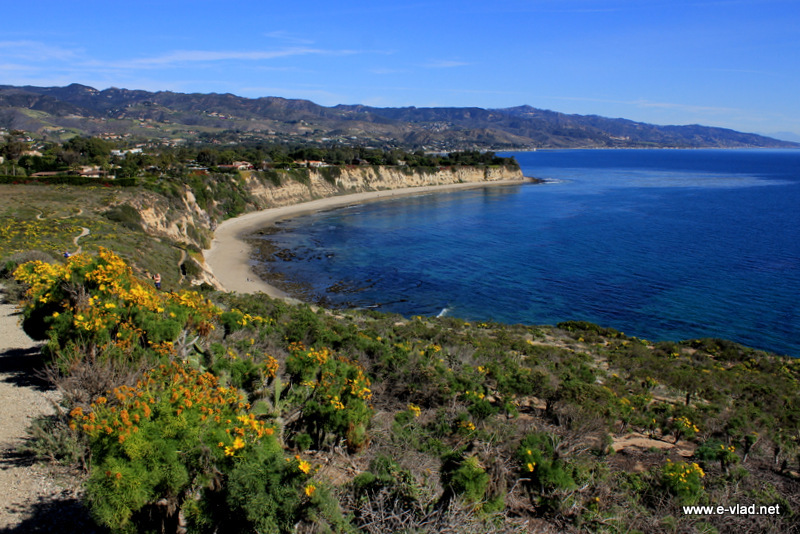 Malibu, California – lots of things to see in one place. Will visit Santa Barbara soon. How to go to the Wineries or the other attractions? Santa Barbara wineries are a little north of the city of Santa Barbara, even though you will be able to find a few wineries in the city Santa Barbara. Drive north of Santa Barbara on the 101 Freeway until you see signs for Solvang. Exit the freeway and drive to Solvang where you will find some wineries around the town. For even more wineries, from Solvang drive a bit north to Los Olivos where you will find even more wineries and tasting rooms. However, the main wine producing area in Central California is which starts from around the San Luis Obispo area south and going North. 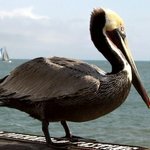 As far as other attractions in Santa Barbara, try to visit the Court house and the tower, the pier, the Mission and walk around on State Street. It all depends on how much time you have to spend in Santa Barbara. 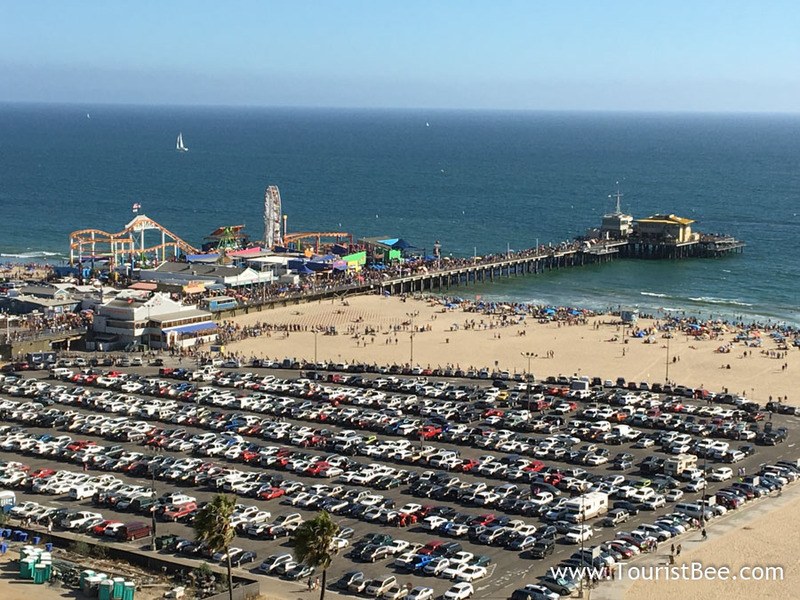 Thanks for the great informative article with some very interesting ideas and points regarding the best of Southern California tourist attractions in one day trip. Amazing, I sincerely did not know or think it was possible to tour the best of Southern California tourist attraction in one day trip. With that said, this is something I’ll consider the next time I bring my family to Southern California. I must admit I find it insightful to read your article. Keep up the good work. CJ…thanx for your note. Yep, this would make for a great day trip for your family. Yes you will be tired at the end of the day but it’s worth it. If you have more time in Southern California, you can take your time and visit more of course.